The Wachock Cemetery rededication ceremony was held on 18 May 2006. Mr. Rafael Feferman, a survivor, was the donor and a key person in designing the walls, gates, plaques and memorial monument. 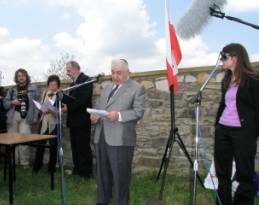 On May 18, 2006 on a Thursday at midday, under clear blue skies, an estimated 500 people gathered outside the newly erected stone walls surrounding the restored Jewish cemetery in the village of Wachock in the center of Poland. Hundreds of local townspeople and school children came together to witness the cemetery’s rededication, joining clergy, Polish government officials, international ambassadors and the media along with 3 returning Holocaust survivors and a dozen first and second generation descendants of survivors. I was among this awesome gathering. My father was born in Wachock in 1923, the youngest of five children. He was 16 when the Germans invaded Poland in September 1939. In 1942, he, his brother and about 50 other Jewish teens and young men were selected by the Nazis to work in the munitions factory in nearby Starachowice. The rest of my father’s family—his parents, 2 sisters, another brother, a brother-in law, a sister-in law, and their two infants—were deported and ultimately murdered in Treblinka. My father and my Uncle David survived the Shoah by escaping from the labor camp and by hiding in underground bunkers in the woods for the last six months of the war. My father died in New York four years ago. All the while during the rededication service, I wondered how my father would have felt had he returned to the place of his birth. Would my father have encouraged me to make this journey? If he were well, would he have come too? Certainly, there were a host of reasons to harbor animosity. Seventy years ago, Poland was home to the world’s largest Jewish community numbering more than 3.3 million. Its cities, especially Warsaw, flourished as centers of Jewish learning and commerce. Its small villages, shtetls like Wachock, were home to ordinary people who lived simple lives. Today, Poland is a graveyard of Jewish ashes, yet there are signs that Jewish life is re-emerging. Even a Museum of the History of Polish Jews is expected to break ground before the end of this year in Warsaw across from the monument commemorating the Warsaw ghetto uprising. I’m told that about 2,500 people live in Wachock today, but none are Jews. In 1939, 500 Jews lived among approximately 1,900 Poles in Wachock. Only 24 survived the Holocaust. Even before the German occupation, an undertone of anti-Semitism prevailed in the shtetl. My father’s earliest memory was as a child of five when he was afraid to begin school. In his memoir, he writes: “Fear was with me always.” When he walked to chayder in the afternoons, after morning secular classes, the bullies hurled religious slurs, throwing snowballs at him in the winter and pelting him with stones in the spring. During the war, there were more examples of Polish indifference—or even worse, Poles who aided the Germans—than there were instances of acts of kindness. After the war, my father told me that Wachock remained a dangerous place. When he returned to his home in 1945, he was not welcomed back. His landlady was astonished at his return, and marveled, “So many Jews survived?” My father was not invited into his old apartment, and there was nothing left of his family’s possessions which had been left in the landlady’s presumable safekeeping. 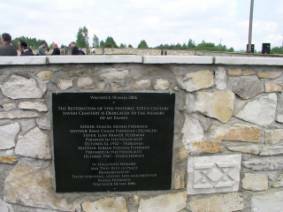 After the war, two other returning Jews to Wachock were murdered by members of the Polish Army Krayova: Yosel Grit and Yosel Malkes. They were buried by my father, my Uncle David and their friend Froyn Wainstain in an unmarked grave in the Jewish cemetery that we had come to rededicate more than 60 years later. We honor the sacred memory of the Jewish victims of Wachock and surrounding communities who died in the Holocaust. We vow never to forget the Jewish men, women and children whose lives were cut short. We weep for what was lost. We shall never forget. A two and a half hour interfaith rededication ceremony, devoted to remembrance and reconciliation, began with a welcome from Mayor Bozena Markiewicz and ended with the recitation of Kaddish, the Jewish prayer for the dead. Speaker after speaker echoed hope for the future, including a letter from Prime Minister Kazimierz Marcinkiewicz and speeches from U.S. and Israeli embassy officials. Mr. Feferman, who now lives in New York, addressed the crowd in their native Polish. He spoke of Pope John Paul II’s exemplary role and presented a special plaque to the cemetery project’s contractor for his outstanding work and personal commitment. Bishop Zygmunt Zimowski of the Radom Diocese urged reconciliation between Jews and Poles, and Poland’s Chief Rabbi Michael Schudrich emphasized the need to do good, which he said is often difficult. Executive Director, Dr. Norman Weinberg of the Polish Jewish Cemetery Restoration Project, the pivotal organization that helped to oversee the cemetery’s repair, spoke of the pressing need to recover a lost Jewish heritage by preserving Poland’s more than 1,200 devastated Jewish cemeteries. The recurring theme of the day was the need to remember, to honor the past and to educate future generations. 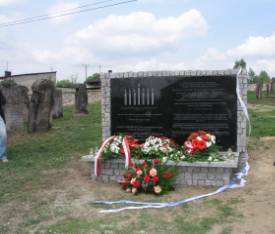 That evening, I learned from Andrzej Omasta, the Polish Coordinator of the PJCRP whose help was invaluable in organizing the details of the cemetery restoration, that after the visitors to Wachock left, the Parish Priest held an unscheduled service with parishioners just outside the cemetery walls, and they prayed for the deceased and murdered and asked for forgiveness. · The packet belonged to Pinkwas Abram Lewi who was married to the daughter of Meyer Schuch. · Pinkwas was born in 1904. His mother was Slata Lewi and his father was Mordka Lewi who was a glazier. · Pinkwas was of average height, had a long face and blond hair. · He had a wife and three children. Two sons and a daughter are shown with their mother in a photograph dated 17 August 1931. The children alone are shown in another photograph several years later, probably in 1938. Pinkwas’ daughter appears in a secular school class photograph dated 17 June 1938. · The family lived on Scharzisko Street close to the market. · Pinkwas is in a group photograph of 20 men in front of a house in Wachock. Half of the men have been identified. The photograph was probably taken in 1935. · A lease agreement between Pinkwas Avram Lewi and another person refers to a dwelling in Wierzbnik, a neighboring town. In an effort to preserve a piece of forgotten history, I’ve sent enlarged copies of the photos to three other surviving Jews from Wachock who are still alive. I will have the packet’s documents translated, and I will attempt to reconstruct from fragments the story of a family that perished. Ultimately, we will donate the materials to a recognized Jewish institution. Perhaps it is because I have no photographs of my own grandparents, and no prewar images of my parents, that I am mesmerized by this treasure that has been held secretly since 1942. The photos and documents of the Lewi family affirm that they did at one time live, though they have no graves and no one to remember them. They were among the hundreds of Jews from Wachock who were murdered in Treblinka. I think my father would share my awe that this historical packet had been returned to Jews. We would wonder together how many other Poles were handed valuables by those who knew they would not be coming back. 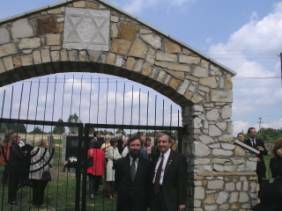 My father would have been gratified if he had lived to see whole classes of school children with their teachers and families attend the rededication of his shtetl’s cemetery. Despite the warmth of the spring day, he would have shivered as old memories surfaced from his horrific past. But he would have been hopeful—the spirit that permitted him to rebuild his life in America, would have given him courage to pray that new generations of Poles will never forget.